According to reports, when the area was being cleared for building this hotel, the body of a woman was found. She had committed suicide by shooting herself in the head. Her ghost is said to remain at the hotel and may manifest as a shadowy form. She also turns the lights on and off and causes cool breezes in the hallways. 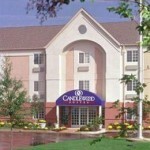 My wife and myself are from Toledo Ohio and booked a room here for the weekend to go see a comedy show. On our first night here I ran across the street to wal-mart while my wife stayed in the room, She was in the bathroom and said she heard someone say Hi, so she opened the door and said Hi baby but I was not back yet and nobody was in the room, The next day at a little after 5pm on 6-14-14 I was half asleep on the bed while my wife was in the shower, I had a hand brush across the top of my head, hard enough to wake me up, I turned and said hi baby, but she was still in the shower and nobody else was in the room. This was an awesome addition to my vacation. I never stayed there but I do know the basis for the haunting is true. It happened in the late 1990’s or early 2000. I can’t remember the exact year but I do know it was around that time frame because I only worked at the Wal-Mart accross the street until I got pregnant with my son in 2001. The guys who I worked in the garden center with were all talking about and freaked out by the fact that a dead body was taken from the construction site. A few weeks later, a door greeter we worked with showed us a snippet from a news article that talked about a suicide of a woman in the wooded construction site. According to the article, they ruled it a suicide because of the gun found near her body. When I heard the hotel was haunted years later, it made sense because I thought, what if she didn’t commit suicide? What if she was murdered? I’d be angry and want to haunt too if my death was ruled a suicide and it wasn’t the case. The article our door greeter showed us didn’t have a name for the woman and I’ve always been curious about her. If she didn’t commit suicide, I hope her ghost can find a way to make that known.